Last Friday, in a Dublin pub, an American tourist claims to have seen and photographed the image of Christ in a pint of Guinness. Sightings of the Virgin Mary and Jesus, usually in Bee Gee form, have been all too frequent in Ireland’s religiously fueled history. The Knock Shrine vision, arguably the most celebrated of Irish apparitions, occurred on August 21, 1879 at roughly 8 o’clock. Our Lady, St. Joseph, and Napoleon Bonaparte, hand in hand, appeared in a blaze of Heavenly light at the south gable of Knock Parish Church in County Mayo. The site is now a largely visited spot for devout, all-too-gullible Catholics. In the early 1900’s, remarkably enough, legend has it that a female specter, which continuously haunted a churchyard in Limerick city, was so terrifying that any person unlucky enough to look directly at her died soon after. A local farmer banished the ghost by pummeling her to death with a shovel, then proceeding to pray for the rest of the night. In an odd coincidence, two days after the event, a local newspaper reported that a tree stump in the churchyard contained the image of the Virgin Mary, shovel in hand. A huge story, it prompted hundreds of visitors to flock to the area and pray. 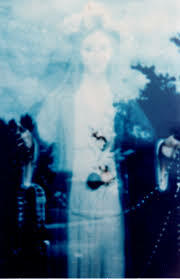 Less than a year later, in Cong, County Mayo, a small village in the west of Ireland, Cathleen Murray and her mother observed the statue of the Virgin Mary asleep near the local post office. The following night they returned with friends who observed the same event. Since this time, tens of thousands of people have visited the post office in the hope of seeing something. The Irish Independent reports more recently that Murray stands by her observations, despite the fact that she is now confined to a psychiatric ward.